Description and Definition of War Clubs. 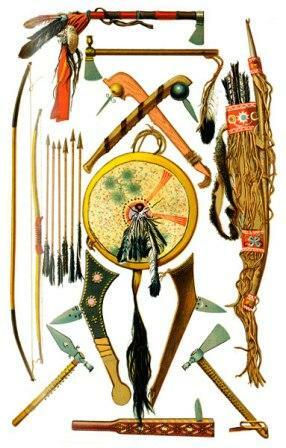 War Clubs encompass a wide variety of weapons used by the different tribes of Native American Indians. The first types of war clubs were simple bludgeoning weapons such as heavy bones, wooden clubs and stone clubs. Examples of the bludgeoning types of war clubs were the jawbone club and the throwing stick or rabbit stick. The skills of the Flint Knappers increased and war clubs were specifically designed with wooden handles and sharpened stone edges which could be used as tools or weapons for throwing and close combat. Although these war clubs all had stone heads these primitive weapons were still deadly. The arrival of the Europeans, the white settlers and traders, introduced new ideas and technology. Later types of Native American war clubs replaced those made of stone, horn, bone and hardened woods with metals such as iron and steel. Tomahawks: The Tomahawk was a hatchet style weapon that had a solid wooden handle with a head made of stone, bone or metal. The tomahawk could be used for close contact fighting or as a throwing weapon. The Traditional The hitting edge of the traditional Stone Club was rounded and measured between 20 - 30 inches long. Jawbone Club: A Jawbone club was constructed out of the jawbone of a buffalo or a horse. The Plains Native Americans would sharpen the hitting edge of the club whilst leaving the teeth inside the jaw bone intact. The jawbone club was used as a close combat weapon and had the ability to cut through the chest of an opponent. 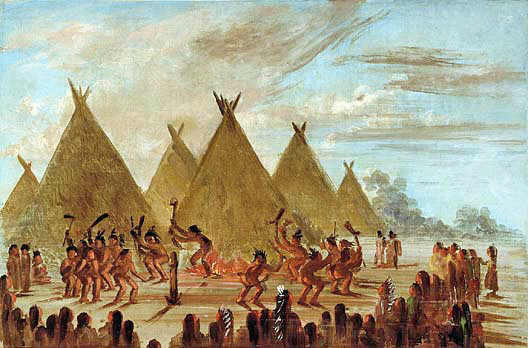 Throwing Sticks - Rabbit Sticks: Throwing Sticks aka Rabbit Sticks were one of the earliest clubs used by Native American Indians. They were a basic short stave or wooden club that had a straight pointed wooden shaft or curved wooden club, similar to the boomerang weapon. Hatchets: A Hatchet is a small axe or club with a short handle that was used with one hand. Battle hammers: A Battle Hammer has a blunt, hammer-like head on one side of the handle or shaft, and usually a beak or point on the opposite side of the club. Stone Ball Club: The Stone Ball club was primitive but lethal. The Stone Ball consisted of a round-headed stone that was covered in heavy buckskin or rawhide and attached to a wooden handle. The head was relatively free-moving and used by the early Plains, Plateau and Southwest Native Indians.